Showing a date can help or hurt your click-through rate in search. Same with showing it on the actual post. Generic advice abounds about whether or not you should include a date, what Google indexes, and how the Google freshness algorithm factors into the mix. This post will help you cut through that noise and come to a conclusion that works for your site and audience. 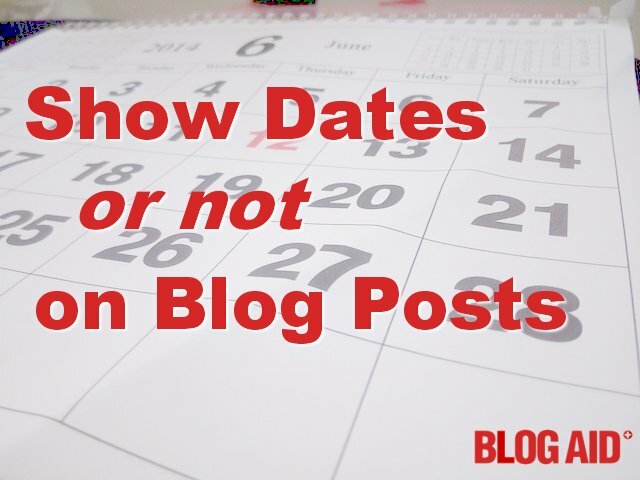 Plus, tips on how to change whether you show dates or not. Update 12/1 You’ll want to see this fantastic BlogAid Blab with my esteemed guest, SEO specialist Mark Traphagen, where we discuss Dates on Posts and SEO. There are several places where the publish date of a post can be displayed and/or indexed by Google. SERPs – (Search Engine Result Pages) – date next to the meta description, shown below. It’s easy to see whether your theme is outputting the date of publication and last modified date. Click the Fetch URL link (shown below). Enter the URL of your blog post. Then click the Validate button on the right. In the lower right pane, click the little arrow in the Custom Search Result Search Filters tab to expand it (shown below). You’ll see a list of the datepublished info. If the post was modified, you’ll see that listed there are well. There are two good reasons to show dates. Displaying dates in permalinks may be advantageous for a news site. It may also be beneficial for sites that cover expiring content, like tech news. Posts from 2012 are largely no longer relevant in 2015. Evergreen content does not need a date. Posts that show a recent date in SERPs are more likely to get clicks. Update 12/1/15 Google has changed they way they apply the freshness algorithm. Now, older posts with more authority will also rank well, even above those with a more recent date. So, older posts have a chance to get more clicks too now. And, because Google likes fresher content too, it’s more likely to rank a newer post ahead of an older one, unless the older one is on a site with more authority. Authority outranks date in SERPs. If your site was set up to include dates in one way are another, and you want to remove them, you can. Changing from one default permalink structure to the postname, or pretty permalink structure is very easy. Yoast, creator of the WordPress SEO plugin, has a super post with a step-by-step tutorial and a special tool (linked in that post) to walk you through making the switch. If you use a Genesis theme, get the Genesis Simple Edits plugin. You’ll easily be able to add or remove the date in the byline. For all other themes, you’ll need to check with the theme developer or a theme designer of your choice to have the code added or removed. You can do this two ways. There are multiple plugins that will alter either the core files in WordPress or your theme files to remove or obfuscate the date so Googlebots can’t index it. Or, you can hire a developer to hard code that function. But, there could be a problem with either of these methods. Depending on how it’s done, an update to the core files of WordPress could undo it. And WordPress changes things all the time. So, just be careful which method you use. There is hidden code on your site for the original day and time of publication and for the last time you modified the post too. This date/time stamp can be indexed by Google whether or not you display a date anywhere to the public. When Google added what has been called a “freshness” component to their algorithm, several folks tried to game the system by making minor modifications to existing posts. That automatically changed the last modified timestamp. And some folks place an update notice, with last modified date, at the top of their posts. This method is mainly a courtesy to readers. But, the Googlebots that index content pick it up too. Update 12/1/15 Google has changed how they apply their Freshness Algorithm. Now, older posts with more authority may outrank fresher content. And, changing the publish date of a post to trick the freshness algorithm is, at best, a short-term strategy that may backfire. Google knows when the original publish date was and can use the Way Back Machine to verify it. Don’t discount this option, even for evergreen content. Let’s say you have a foodie blog. And you have a stellar apple pie recipe. Things do change. There are fad diets and preferences popping up all the time. So, maybe your evergreen content is not so evergreen. Maybe folks want to know how to make a gluten-free apple pie. That’s worth a new post. And, gives you the opportunity to get a hot buzz phrase in your title. If you want to change to a nicer or shorter permalink structure, yes, it’s worth your while to do that. If you write evergreen content, it very well may be worth your while to remove all dates so you’re older posts get more clicks by removing reader bias. If you want to play a game with Google indexing, you better do your homework, and I hope you like gambling. You’ll find contradictory data about whether modifying a post, or republishing on a more recent date works or not. And since you’re deliberately trying to game the system with those tactics, Google will eventually catch on and may begin to issue penalties at any time. Update 1/25/16 Don’t play the modify publish date game with Google. You’ll lose. The bottom line is, make the most of the method that is best for your site and audience. And then stick with it. If you do make a change, resubmit your XML sitemap to Google Webmaster Tools. And then hurry up and wait. It may take 2-3 months for Google to fully re-index your site and for the results to start showing in SERPs. Do you display dates? Why or why not? I made the decision to eliminate dates when I upgraded my site since my content is evergreen. Excellent article with good resources. I liked the testing tool. That’s a good time to do it Ann!! Thanks for your kind words. Carolyn, some folks have tried that tactic. But as mentioned in the post, Google thinks they are trying to game the system. I’m not sure there is a perfect fit for the types of posts you write, Carolyn, as far as search indexing. I’d set it to the way most of my posts are, and let it be. Or, just put an update in the text. That will get picked up in the last modified date too.